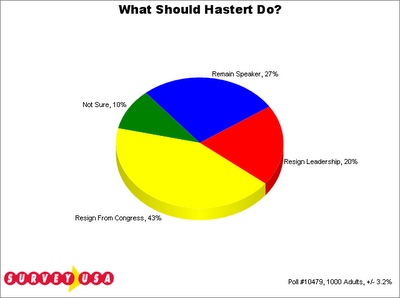 House Speaker Dennis Hastert still hasn't resigned his position after the political fallout over the Foley scandal, and the debate continues as to whether he should. The smartest thing for him to do to take some of the heat off may be to simply announce he won't seek the Speaker's chair in the 110th Congress should Republicans retain control of the House. The odds currently are that Republicans will be in the minority, and there is little chance that his colleagues will elect him to the job again if they remain in the majority.